Trailer Adaptors may be used to easily mate trailers and vehicles with different end Plugs or Sockets. This prevents the need to re-install another Plug or Socket to Match. For Example: If you are running a 7 Pin Flat Trailer Socket from your Vehicle and a Small Round Trailer Plug on your Trailer, you would require a 7 Pin Flat Trailer Plug to a 7 Pin Small Round Trailer Socket Adaptor to complete your connection. What are the Benefits of using a Trailer Adaptor? Using a Trailer Adaptor entails many benefits. Not only does it prevent the user having to re-install a trailer Plug or Socket to match (if they have a miss-matching Plug on the Car to what is installed on the Trailer), but also provides extra length between the Car and Trailer connections, making it popular in the caravan and 4WD markets. The innovative ideas from KT continue in the release of the first ever Car Coil Adaptor. In the past, problems of cable strain on towed vehicles can pull out the Adaptor and similarly should the lead be to long then the cable can drag . The KT Car Coil Adaptor features a 1 meter of coiled cable allowing flexibility and prevents Adaptors being pulled out of sockets. Switch to turn ‘On’ LED Circuit Tester. The Inbuilt circuit tester was introduced to the Trailer Plugs, Sockets and Adaptors to ensure a ‘Safer Towing’ environment and spread awareness of trailer light circuit failures for all road users by providing products suitable for a wide range of markets. Incorporating the LED Trailer Plug which features an in-built LED Circuit Tester was a great KT innovation. The In-built LED Circuit Tester enables the user to check that there is power to each wiring circuit and detects any wiring faults, loose connections and corroded pins caused by general ‘wear and tear’. The LED Trailer Plug features 6 LED’s. When the Plug is switched ‘On’ these LED’s illuminate to indicate a secure power connection. If any of the LED’s are not illuminated, this indicates a faulty connection. Inbuilt LED Circuit Tester helps indicate faulty circuits. It can test Left & Right Indicators, Brake (Stop) Lights, Park Lights, Reverse/Auxilliary and Service Brake Circuits to Ensure Power is running through to each circuit. 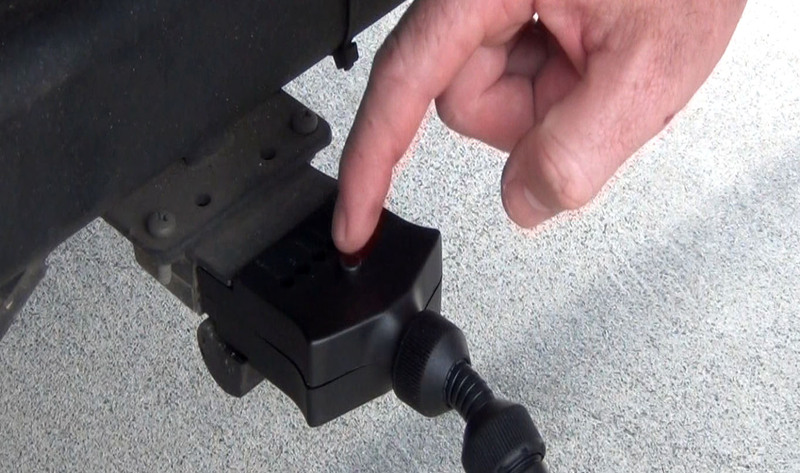 Connect the adaptor to the vehicle socket and the trailer plug. The inbuilt tester will check that the electrical circuit for the Indicators, Park Lights, Brake Lights, Service Brakes and Auxiliary by pressing down the switch. Providing that the tested circuit has power from the application then an LED light will illuminate to verify that power is passing through the connector. If any LED’s fail to illuminate the tester will assist in determining where the fault is located. If no LED’s illuminate then check the earth connections at the vehicle trailer socket. Generally this is a white wire.Should any LED’s in indicators, park or brake fail to operate then check the relevant connection at the trailer socket on the vehicle.Should a different LED illuminate to the circuit being tested then there will be a cross wired connection at the trailer socket. This can be corrected by fitting the trailer cable to the correct terminal connection in the socket. Should your vehicle not be wired for auxiliary or service brakes then the 2 relevant LED’s will not illuminate as there will be no power. To turn off the tester simply press button. The KT LED Trailer Coil Adapter will not detect broken or damaged cable from the plug to the application nor will it detect faulty globes or LED lights. LED Circuit Tester LED Configuration for 7 Pin Flat Plug & Socket, 7 Pin Small Round Plug, 7 Pin Large Round Socket. 7 Pin Small Round Socket uses this same configuration however is slightly curved with the shape of the socket. LED Circuit Tester LED Configuration for 7 Pin Large Round Plug and 7 Pin Large Round Coupling Socket. The KT Car Coil is very popular in the 4WD, Caravanning and Camping Markets due to its ability to stretch up to 1M in Length. The Car Coil Adaptor provides flexibility and length between connections, preventing plug pull-out and Dragging. It is great for towing in rough terrain where the vehicle may be required to take sharp corners and dips. 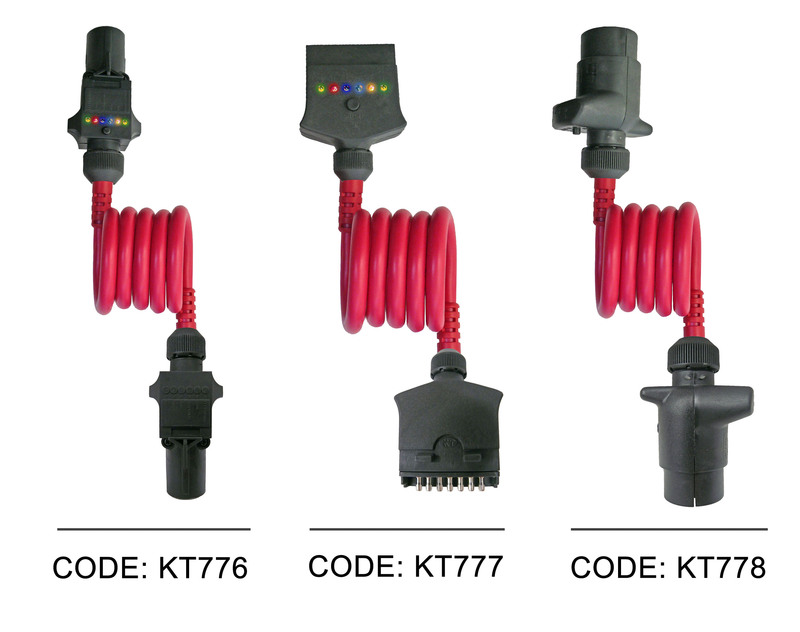 The KT Standard Adaptor Range includes 6 Adaptors to suit all vehicle types. 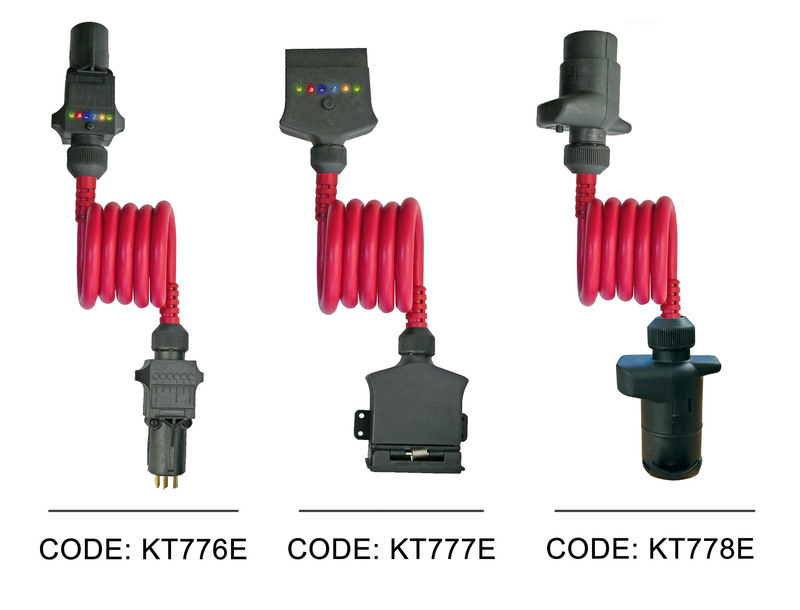 KT Standard Adaptors are durable and provide flexibility between vehicle and trailer connections. A conduit between the Plug and the Socket of the Adaptor protects internal wiring from harsh weather conditions and possible damage. KT LED Trailer Adaptors provide 2 different connections for the users who have 2 different connections. (Eg: A 7 Pin Small Round Socket on their vehicle and a 7 Pin Flat Plug on their Trailer). The In-Built LED Circuit Tester allows the user to test the circuits in their trailer to diagnose any faulty connections. This helps determine if the fault is located in the vehicle or the trailer. The LED’s will not illuminate if there is no power to the trailer from the vehicle. This range was initially developed in mind of the 4×4 and caravaning markets. The coil stretching up to 1M in length, provides flexibility when towing around sharp corners or high speed humps, eliminating plug pull-out and dragging. The Car Coil Adaptor is the first of it’s kind and very popular in the 4×4 market. This range includes 6 Adaptors to suit a variety of connections. The LED Car Coil Extensions Range came about after extensive marketing research. It was discovered that many Trailer owners preferred to have a Trailer Socket on their Vehicle and a Trailer Socket on their Trailer at all times. The idea of this was that the Trailer Socket contains a spring-loaded dust-proof cover and by leaving this on the Vehicle and Trailer, the pins would always be protected from dirt and dust entering the socket and always protected from harsh weather conditions. The Car Coil Extension & Extension Leads Range was shortly released after the similar LED Car Coil Adaptors Range. This particular range is designed to ‘extend’ the connection that already exists. Some users prefer the extension as they can leave a socket connection on their vehicle and trailer at all times. (All KT Sockets contain a spring loaded retracting cover, preventing dirt and dust entering connections).